View of the quadrangle of Magdalen College, showing the chapel, which was finished in 1480. This quadrangle is unusual in that it has a cloistered walk around it. Magdalen College was founded in 1458 but work on the buildings did not begin until 1472. 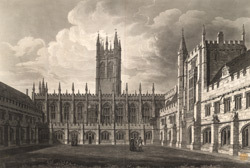 The college plan is similar to that of New College and All Souls, which were built by the same mason, William Orchard. The style of the architecture here is softer and more decorative.